7 Night Stay in a 1, 2 or 3 bedroom Suite Rayburn Country Club Resort in Sam Rayburn, TX NEAR HOUSTON! 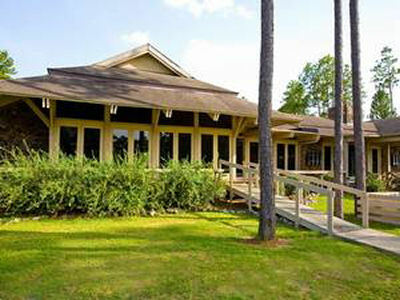 Rayburn Country Club Resort in Sam Rayburn, Texas NEAR HOUSTON - Buy a 7 Night Stay in a 1, 2 or 3 Bedroom Suite! Enjoy 7 Nights in a 1, 2 or 3 Bedroom Suite at Rayburn Country Club Resort in Sam Rayburn, TX NEAR HOUSTON! Nestled in the woods, the air is clear and pine-scented at Rayburn Country Club Resort, and the smiles of the staff are warm and genuine. Here you have country living at its best. You won’t want to miss the sun rising in the sky each morning and its spectacular sinking at dusk—especially on Lake Sam Rayburn, which is close to parts of the property. Golf is excellent, considered by many to be the most challenging and beautiful in Texas. Take a plunge in our pool and relax in the hot tub. This is a vacation you’ll want to return to, again and again. Lake Sam Rayburn is beautiful, whether you want to sun and swim, enjoy the sunsets, walk through towering woods of pine, listen to melodic songbirds, fish, or hunt. “Big Sam” boasts some of the finest freshwater fishing in America. It’s been the home of trophy bass fishing in Texas for 30 years, and crappie fishing is great, too. Powell Park Marina, on the south end of the lake, is a good place to angle. Bird watchers will find bald eagles and ospreys. Hunters will thrill to the sound of deer, duck, and feral hogs, in Type II, National Forest, and Corps of Engineers property. Rayburn Country Club Resort is perfect for families of all sizes. Sleep, eat, and relax in air-conditioned comfort. All units are carpeted, for your barefoot pleasure. Each unit enjoys a full, comfortable kitchen, great for cooking up the bass or crappie you caught that day. Laundry facilities are conveniently located on the premises. 1 bedroom units: with a maximum occupancy of 4 have 1 bath, 1 queen bed, 1 sleep sofa and a full kitchen. 2 bedroom units: (maximum occupancy 6) have either 2.5 baths, and varying bed structures. Some units will sleep up to 10. 3 bedroom units: (maximum occupancy 8) have either 2.5 baths, and varying bed structures. Some units will sleep up to 14.